Volognano (Rignano sull’Arno), San Michele. The surface is abraded, a crack appears from the abdomen of the Virgin to the base of the sarcophagus, and the paint is missing along the bottom edge. It was restored in Florence, 1961-1964. Carocci, II, 1907, 65, as manner of Sarto. G. Dainelli and G. Poggi, in Toscana, 1924, as Granacci (from Berti, 1983, 46). Luciano Berti, in Primato del Disegno, 1980, 102, 119, Color Pls., 191, no. 450, as Rosso, 1514-1516. G. Briganti, in La Repubblica, March 18, 1980, apparently as by Rosso, and R. Bellonzi, in Il Tempo, April 28, 1980, as not by Rosso (both as reported in Berti, 1983, 59, n. 9). Berti, 1983, 46-56, Figs. 1-3, Color Pl. II, as Rosso, around 1514-1516. F. Petrucci, in I dintorni di Firenze, arte storia paesaggio, Florence, 1983, 143, as Puligo (from Angelini, see below; La Porta, 1992, 32, stated that this opinion was made by Alessandro Conti). Berti, 1984, 153, as Rosso, around 1516. Darragon in Vasari-Darragon, 1984, 178, as recently attributed to Rosso. Wilmes, 1985, 94, as not by Rosso but from the circle of Sarto. Antonio Natali, in Sarto, 1986, 99, 102, Fig., as shop of Sarto, designed by Sarto, and executed perhaps by Rosso and Pontormo (like the lost predella of the San Gallo Annunciation) [L.2]. Conti, Alessandro, Rignano sull’Arno. tre studi sul patrimonio culturale, Florence, 1986, 45-97, reported that in 1966 Marco Chiarini related the picture to Puligo, which Conti proposed again, publishing a document of a “visita pastorale” of 1539 confirming that the painting was in S. Michele by that time (from La Porta, 1992, 32, 41, ns. 12-13). Angelini, 1986 (1987), 88, as by a pupil of Sarto, with Puligo being more acceptable (than Rosso). 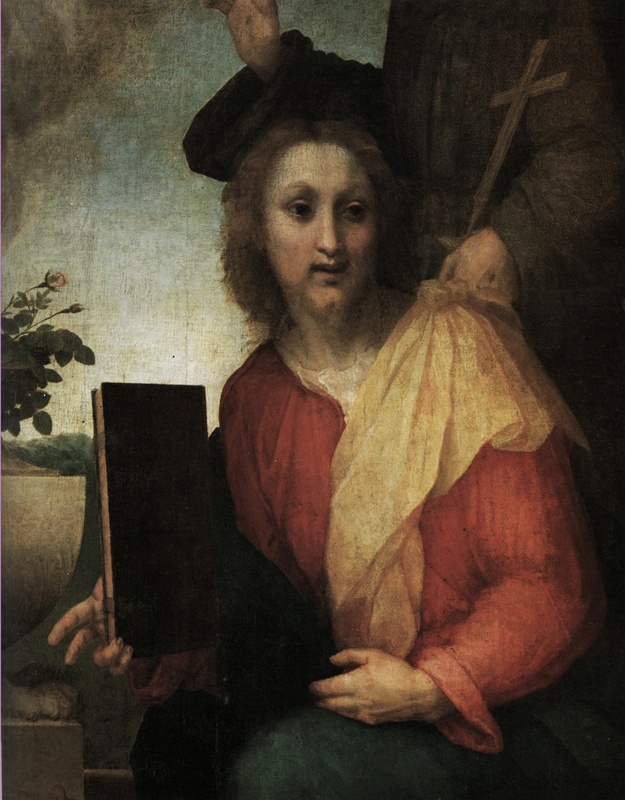 Paolucci, in Pittura, Cinquecento, 1988, I, 300, as probably Rosso’s first work, 1514-1516. A. Giovanetti, in Pittura, Cinquecento, 1988, II, as hypothetically attributed to Rosso. Natali, in Natali and Cecchi, 1989, 7-9, 18, Color Pl., as Sartesque, but difficult to attribute, indicating an “idea iniziale,” by Andrea, and executed a little after 1512 and after a trip to Rome, and perhaps executed partially by Rosso, as suggested by the motifs of St. Thomas and St. Francis and by the angels. Ciardi and Mugnaini, 1991, 21, as difficult to attribute to Rosso. La Porta, 1992, 32-35, and Figs. 6, 8, 10, 12, as designed by Sarto and executed by Puligo before 1520. 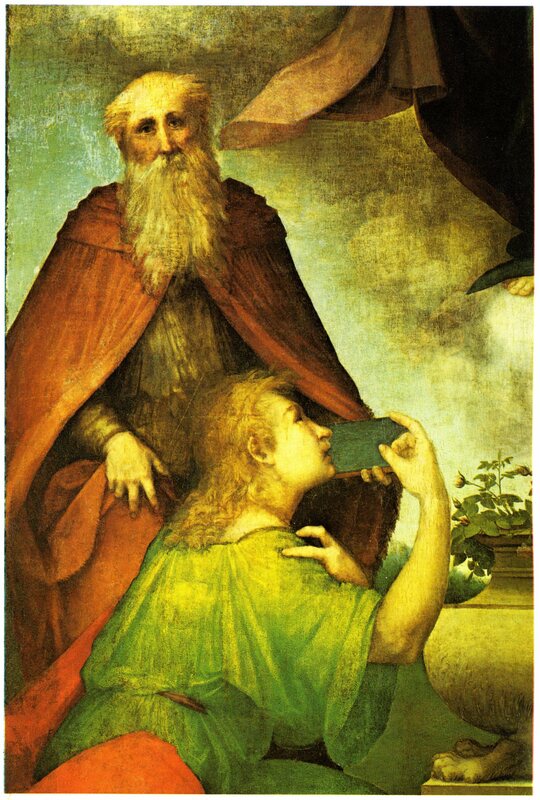 Berti, 1993, 184, Color Fig., as from Sarto’s shop with the prevalent intervention of Rosso and as still convinced of Rosso’s authorship, c. 1512-1514. Franklin, 1994, 8, 271, n. 26, as little to recommend it as by Rosso. Costamagna, 1994, 78, 98, ns. 49-50, as from Sarto’s shop around 1525-1530, suggesting Foschi, Jacone and Jacopino, and above all Salviati and Vasari. Brown Butters and Elam recognized the painting as “Sarto-like” and thought it “looks almost too confident for the artist of the SS. Annunziate Assumption…” They went on to say: “While it is hard to suggest an alternative attribution from Sarto’s circle for such an outstanding work, it must nevertheless be noted that if this is early Rosso, Vasari’s account of his contrary refusal to follow any prevailing style was wide of the mark.” Bellonzi thought it a “pittura modestissima” without “gli eroici furori disegni e coloristici” of Rosso. These remarks seem to me much to the point. The Volognano altarpiece is a modest work clearly by a rather academic Sartesque cast without any of the spirit of Rosso’s art from any moment in his career. The description and arrangement of the full-length standing cherubs recall what appears in Sarto’s Assumption in the Pitti, Florence (no. 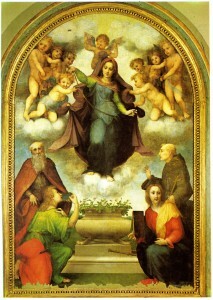 191), done between 1522 and 1525,1 while the kneeling and seated cherubs closely resemble those in the Madonna in Glory with Four Saints (Assunta di Poppi), also in the Pitti (no. 123), begun by Sarto in 1529 and finished by Morgante Bonilli da Poppi in 1540.2 The cherubs in both of these pictures have a very similar prettiness. 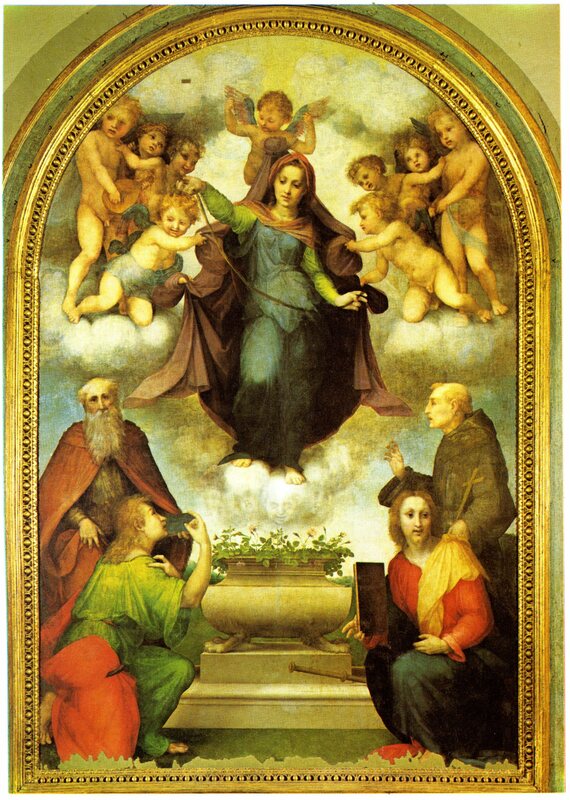 A similar if not identical sweetness appears in the Christ Child and cherubs in the Madonna delle Grazie in the Cathedral of Pisa begun by Sarto in 1530 and largely painted later by Sogliani.3 The Volognano painting seems to be a work done after Sarto’s death. Its lack of robustness in form and composition indicate that it is not based on a Sarto design, nor does it seem to have been executed by more than one hand, as suggested by Natali. The proposal of Puligo as the painter of the altarpiece, on a design by Sarto or not, while made by several critics does not seem right to me. 1 Freedberg, 1963, I, 60-62, Fig. 119, II, 112-120, no. 52. 2 Freedberg, 1963, I, 93, Fig. 232, II, 194-196, no. 88. 3 Freedberg, 1963, I, 93, Fig. 237, II, 198-199, no. 90.